Wright was born in Poole, Dorset and grew up predominantly in Wells in Somerset. He attended The Blue School, Wells from 1985 to 1992, and is honoured by a plaque at the school. Throughout the late 1980s and early 1990s, he directed many short films, first on a Super-8 camera that was a gift from a family member and later on a Video-8 camcorder that he won in a competition on the television programme Going Live. These films were mostly comedic pastiches of popular genres, such as the super hero-inspired Carbolic Soap and Dirty Harry tribute Dead Right (which was featured on the DVD release of Hot Fuzz). The critical success of Spaced paved the way for Wright and Pegg to move to the big screen with Shaun of the Dead, a zombie comedy which mixed a "Brit flick" romantic comedy style with homages to the horror classics of George A. Romero and Sam Raimi. The film was a success critically and financially, and its rooting in American genre cinema helped to make it an international hit. In November 2015, it was announced that Wright would direct and co-write with David Walliams a DreamWorks Animation film centered on "the concept of shadows", that has been in development since 2010. Shadows, as the film was known, was to be Wright's animation directorial debut. The film has been in development for a long time, changing directors. Mark Dindal, who created the film's original story, was involved between 2010 and 2012, was replaced by Alessandro Carloni from 2012 to 2015, and Wright is slated to develop the picture. Three drafts of script were written but the project is on hold due to staff changes at DreamWorks leaving it in limbo. In January 2019, it was announced that his next film will be a horror thriller film set in London and inspired by movies such as Don't Look Now and Repulsion. In February 2019, it was revealed that the title was Last Night in Soho, with Anya Taylor-Joy attached to star. In February, Matt Smith and Thomasin McKenzie joined the cast. Other confirmed crew members include co-screenwriter Krysty Wilson-Cairns, editor Paul Machliss (who edited four episodes of Spaced in 2001 and all of Wright's films since Scott Pilgrim vs. the World), and Baby Driver production designer Marcus Rowland. French and Saunders Yes No Episode: "Titanic"
Murder Most Horrid Yes No Episode: "Confessions of a Murderer"
^ Romano, Nick (24 June 2017). "Edgar Wright explains how Ant-Man departure led to Baby Driver". Entertainment Weekly. Archived from the original on 26 June 2017. Retrieved 21 September 2017. ^ "Video Archives: Hot Fuzz – The Director's Cut Trailer (2007)". Edgarwrighthere.com. 3 September 2009. Retrieved 28 August 2016. ^ Reader, Jane (8 July 2018). "Strictly judge Dame Darcey honoured by Arts University Bournemouth". Bournemouth Echo. Retrieved 9 July 2018. ^ "Shaun of the Dead > The Production > Edgar Wright". Archived from the original on 18 May 2009. Retrieved 6 May 2009. ^ "Episode 445 - Edgar Wright". Wtfpod.com. Retrieved 28 August 2016. ^ Wright, Edgar. Interview by Robert K. Elder. The Film That Changed My Life. By Robert K. Elder. Chicago: Chicago Review Press, 2011. N. p6. Print. ^ Every Frame a Painting (26 May 2014). "Edgar Wright - How to Do Visual Comedy" (Video Essay). YouTube. Retrieved 18 February 2018. ^ Collis, Clark (30 August 2013). "3 Blokes. 3 Films. Many, Many Laughs". Entertainment Weekly: 46–47. ^ Topel, Fred (7 April 2007). "Edgar Wright's "Don't" Trailer Could Be "Grindhouse 2"". Rotten Tomatoes. Flixster. Retrieved 30 April 2015. ^ a b "Kevin Smith Talks Scott Pilgrim". The Film Stage. 3 March 2010. Archived from the original on 14 January 2011. Retrieved 18 August 2013. ^ Fischer, Paul (9 April 2007). "Interview: Edgar Wright for "Hot Fuzz"". Dark Horizons. Archived from the original on 23 May 2007. Retrieved 23 March 2009. ^ "Scott Pilgrim vs. The World – Box Office Data". The Numbers. Retrieved 12 April 2011. ^ Child, Ben (10 May 2012). "Simon Pegg and Edgar Wright brew plot for World's End". The Guardian. London. ^ Masters, Kim; Kit, Borys (28 May 2014). "Why 'Ant-Man' Director Edgar Wright Exited Marvel's Superhero Movie". The Hollywood Reporter. Prometheus Global Media. Retrieved 30 April 2015. ^ "MARVEL STUDIOS & EDGAR WRIGHT STATEMENT". Marvel. 23 May 2014. Retrieved 24 May 2014. ^ Tapley, Kristopher (22 June 2017). "Playback: Edgar Wright on 'Baby Driver,' Music and Walking Away From 'Ant-Man'". Variety. Retrieved 24 June 2017. ^ Rosen, Christopher (6 January 2015). "Watch The First Trailer For Marvel's 'Ant-Man' (It's Too Late To Change The Name)". Huffington Post. Archived from the original on 7 January 2015. Retrieved 7 January 2015. ^ Fleming Jr., Mike (22 July 2014). "Comic-Con: Off 'Ant-Man' Hill, Edgar Wright Sets Sights On 'Baby Driver'". Deadline Hollywood. Penske Media Corporation. Retrieved 30 April 2015. ^ "Edgar Wright's 'Baby Driver' Moves Up Nearly Two Months to June". Variety. 27 March 2017. ^ "Baby Driver". backstage.com. Retrieved 11 December 2015. ^ "Jon Hamm and Ansel Elgort are headed back to Atlanta for 'Baby Driver'". onlocationvacations.com. 8 December 2015. Retrieved 11 December 2015. ^ "Jamie Foxx's 'Baby Driver' Atlanta Casting Call for Teens, Soldiers, and Musicians". Projectcasting.com. 11 February 2016. Retrieved 28 August 2016. ^ "Johnny Depp in Talks for Edgar Wright-Helmed Neil Gaiman adaptation". Variety. 23 October 2015. Retrieved 28 October 2015. ^ "Edgar Wright & David Walliams' animated film in limbo". Denofgeek.com. Retrieved 28 October 2017. ^ "Disney Taps Edgar Wright To Helm Johnny Depp In 'The Night Stalker' Feature Redo". Deadline Hollywood. 22 February 2012. Retrieved 28 February 2012. ^ "Edgar Wright to Direct 'Grasshopper Jungle' Movie for Sony". Deadline Hollywood. 25 July 2014. Retrieved 28 February 2015. ^ "Baby Driver 2: Edgar Wright has been asked to write sequel". independent.co.uk. 6 July 2017. Retrieved 29 September 2017. ^ "Edgar Wright to Tackle 70s Cult Band "Sparks" in New Documentary". Collider. 21 June 2018. Retrieved 22 June 2018. ^ "Edgar Wright's Next Film is Pop-Rock Documentary About Sparks". ComingSoon.net. 21 June 2018. Retrieved 22 June 2018. ^ Sharf, Zack (21 June 2018). "Edgar Wright's Next Film Is a Documentary on Cult Pop-Rock Band Sparks — Exclusive". IndieWire. Retrieved 22 June 2018. ^ Travis, Ben; Nunget, John (21 January 2019). "Edgar Wright's Next Film Is A Psychological Horror, Plus Baby Driver 2 Update – EXCLUSIVE". Empire. Retrieved 21 January 2019. ^ a b Sharf, Zack (21 February 2019). "Edgar Wright Horror Film 'Last Night in Soho' Casts 'Leave No Trace' Breakout Thomasin McKenzie". IndieWire. Retrieved 17 March 2019. ^ Kroll, Justin (4 February 2019). "Anya Taylor-Joy to Star in Edgar Wright's Thriller 'Last Night in Soho' (EXCLUSIVE)". Variety. Retrieved 4 February 2019. ^ Marc, Christopher (16 March 2019). "Oscar-Nominated 'Baby Driver' Editor Paul Machliss Expected To Reunite With Edgar Wright On His Psychological Horror Film 'Last Night In Soho' Starring Anya Taylor-Joy". HN Entertainment. Retrieved 17 March 2019. ^ Jr, Mike Fleming; Jr, Mike Fleming (18 June 2018). "Amblin, Sam Mendes Set WWI Drama '1917' As His First Directing Effort Since James Bond Pics 'Spectre' & 'Skyfall'". Deadline. Retrieved 11 March 2019. ^ Clarke, Stewart; Clarke, Stewart (22 January 2019). "Edgar Wright Preps London-Set Psychological Horror Movie, Talks 'Baby Driver 2'". Variety. Retrieved 11 March 2019. ^ a b "Edgar Wright on The World's End, Man-Child Movies, and Not Tweeting While Making Ant-Man". Vulture. 8 August 2013. Retrieved 30 March 2014. ^ Moriarty. "Edgar Wright Throws His Own New Bev Fest In LA! Awesome Line-Up Of Movies And Special Surprises!..." Aint It Cool News. Retrieved 13 March 2017. ^ Yamato, Jen (14 January 2011). "Edgar Wright on The Wright Stuff II: 'Envy These Virgins!'". Movieline. Retrieved 13 March 2017. ^ Cozzalio, Dennis (7 December 2011). "DIRECTOR EDGAR WRIGHT ON CINEMATIC SHORTCOMINGS, THE DIM FUTURE OF 35mm AND MEMORIES OF A BRITISH ICONOCLAST". Sergio Leone and the Infield Fly Rule. Retrieved 13 March 2017. ^ Wright, Edgar (5 August 2013). "The New Beverly Cinema Presents: 'THE WORLD'S END IS NIGH' Season – Curated by Edgar Wright". 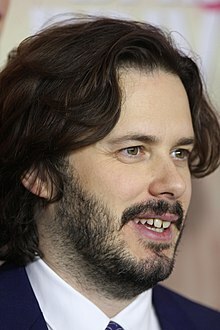 Edgar Wright Here. Retrieved 13 March 2017. ^ Hemmert, Kylie (21 September 2018). "DuckTales Renewed for Season 3 Ahead of Season 2 Premiere". Coming Soon. Retrieved 21 September 2018.